Rajinikanth Film Review From Illamai Oonjaladukirathu. Illamai Oonjaladukirathu Movie. Rajini Film Illamai Oonjaladukirathu. Rajinikanth Illamai Oonjaladukirathu movie. www.rajinikanth.com. Oonjal Adudu .. Song. 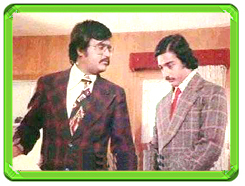 The story runs for half hour showing Kamal and Sree Priyas Love in 1980's Style. Those who want to know how our hero's and heroine's make Love in 1980's ... The hero will be riding a 1980 HARDLEY DAVIDSON BYKE and it will make sound like a "KARI ENGINE" that runs from Chengalput to Vizupuram and the heroine who will be wearing a Saree Preferable White Color and a White Jacket and All her inner Cloths will be visible who will be sitting with the hero in that HARDLEY byke and the hero will be riding that byke in Mount road. The hero will be wearing a GLASS which has a BLACK FRAME and it will cover half of his face and SPB will be singing a song.